When you have a migraine, your whole life seems to go down the tubes. You aren’t eating right, sleeping right or doing all the things you want to or need to. If you’re in between migraines right now, it’s time to get you back in the grooves of eating right via healthy salads. Just as there are many foods that cause migraines, there are also many foods that prevent them. There are many health benefits of salad. Here are a few recipes that can help you feel good again – and stay good for longer periods of time in between your migraines. Strive for 8 servings of vegetables and fruits a day. It’s really not that difficult to do when you simply incorporate two salads into your day. Both salads can be created early in the week and then when all the busy times come during that week, you are comforted because you have food ready to go in the refrigerator; all you have to do is scoop it out onto your plate. In a large bowl, add lettuce, kale and spinach leaves. Toss. In a separate bowl, mix ingredients for dressing. You could do this in a blender. 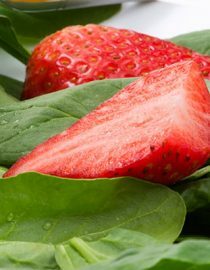 Add radishes, cucumbers, tomatoes and strawberries to the salad. Toss again. Drizzle the salad dressing on top, then toss lightly. Add the eggs and almonds on top of the salad as garnish. Serve. In a large bowl, layer lettuce and watercress, tomatoes, then beans. Next sprinkle half of the seasonings (oregano and basil) over this salad mixture. Add new layers of green pepper, red pepper, and yellow pepper. Add the baby lentils and add the remaining seasonings. Lastly, add the olive oil and lemon, drizzling it over all ingredients. Allow this salad to marinate in the refrigerator for two hours before serving. Some research suggests that anxiety and depression can trigger migraines or migraines can trigger anxiety and depression. Alice shares her tips for coping. You might also like...Can Dehydration Trigger a Migraine?